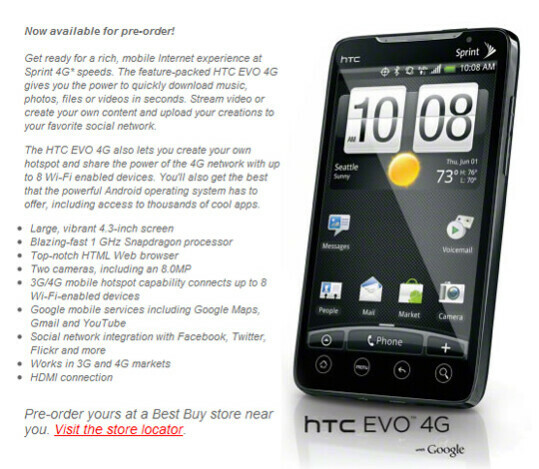 Not sooner did Sprint finally clear things up surrounding the HTC EVO 4G's exact pricing and availability, big box retailer Best Buy surely jumped onto the scene to capture some of the attention as they announced starting up their usual pre-order process. If having to fork over $299.99 up front to get your hands on a brand spanking new HTC EVO 4G at a Sprint retail location doesn't float your boat, you can simply bypass that mail-in-rebate and scoop up a handset for the easier to swallow price of $199.99 on contract at a select Best Buy location. Depending on what shipment levels Sprint has for the smartphone, we're hoping that there will be enough to satisfy the initial demand so that customers won't have to quickly scurry to other locations trying to find one. As opposed to doing that, you can drop by a participating Best Buy location where you won't have to be put through those long wait times and lines when this thing goes live on day one. Following what we've seen in the past with their pre-order process, customers would have to hand over $50 to Best Buy which is then placed onto a gift card to signify your guarantee. When launch day comes around, you can go back to the store where you placed the pre-order and use the gift card towards the purchase of it. You sound like a pure hater...considering the only thing that you say that is somewhat true is there isnt 4g everywhere but guess what there is 4g in major cities and its still growing. Verizon wireless on the other hand does not have a 4g phone as of right now. Im sure people know what they are buying and if they have 4g or not so looks like its up to the customer. So the longer anyone else take to get it sprint is going to eat up as much as they can considering they are pretty far behind in the customer dept lol. beside having 4G on this phone, this phone conquers in every other way compared to any phone verizon has, including the droid incredible, so you are an idiot.